Crystal Meth (also known as crystal, ice, crank, speed, ice) is a crystalized methamphetamine that, like cocaine, is a stimulant. The effects of crystal meth lasts for 6–8 hours or more depending on how much is used. It comes in the following forms; powder, pills or “shards”. Crystal meth should be white to clear in colour. Crystal meth that is coloured might be contaminated with things like fertilizer, red phosphorus or lithium. Crystal, like any stimulant drug, acts like adrenaline in the body, affecting the brain, heart, lungs and other organs. The effects of crystal meth can vary depending on how much is used and for how long. When crystal meth is used for days at a time the body can to start to have jerky and twitchy movements that can’t be controlled. Some people may start “picking” at their skin, experience things like hearing voices or seeing things that are not really there and become paranoid. What are the health effects of taking crystal meth? Can you get HIV, Hepatitis B or Hepatitis C if you are using crystal meth? If you are sharing drug using equipment such as stems or bowl pipes with others, you can become infected with the viruses that cause HIV, Hepatitis B and Hepatitis C.
For more information visit Smart Works. How would I know if someone is having an overdose on crystal meth? What should I do if someone is having an overdose from crystal meth? Stay with the person if it is safe to do so. If the person is having seizures. Not breathing or swallow breathing. Is a risk to themselves or others. Encourage rest until help arrives. Apply cool clothes to back of their neck or forehead to help them cool down. If they are not breathing or have no pulse start CPR. If they are having a seizure; clear the space, place them into the recovery position, support their head and make sure their airway is clear. Will naloxone reverse a crystal meth overdose? 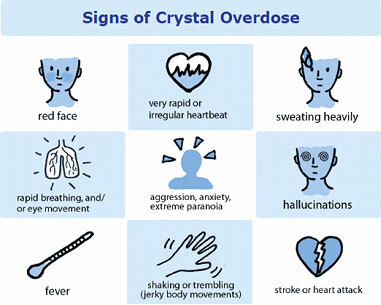 Naloxone is not effective on an overdose where pure crystal meth is suspected to be the cause. Right now many of the other street drugs are mixed with opioids such as fentanyl. If you are not sure what the person has taken it is always better to call 911 and give naloxone. What resources are available for people who use crystal meth? Crystal meth use, like all substance use, happens along a spectrum from not using to dependency. Below are some of the local resources.